This is the only wrestling game on the Neo Geo. 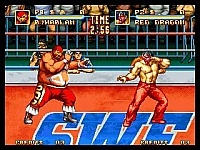 You may or may not know that my favourite 2D wrestling game in the arcades is WWF Wrestle Fest (Not a Neo Geo game, it's by Technos Corp). That is one game that I will always remember, mainly because I spent so much time on it in the arcade when I was back in school. I hadn't ever played this game until recently and I have to say that I was a little disappointed. You get to pick from a selection of 10 wrestlers, obviously none of them are real, just fantasy ones. There is not really a massive difference between characters, but I think they have some different special moves and some seem slightly stronger/faster than others. Once in the ring, you will find that the controls are fairly simple. 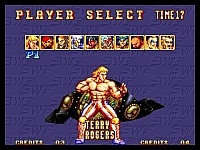 The A button is used for punches and for picking up a downed opponent, the B button is used for Kicks, the C button is used for jumping and for elbow dropping someone when they are on the floor and the D button is used taunt your opponent and to pin them when their energy is low enough. You can also dash across the screen by tapping left/right twice quickly. When you get close to the other wrestler you get into a grapple. At this point you just hammer the buttons and hope that you win it. This works in the same sort of way as most other wrestling games, but unfortunately the CPU seems to win these 70% of the time no matter what you do. This can be very frustrating! One area where I think this game is good is in the fact that on some levels you are not actually fighting inside a normal wrestling ring. 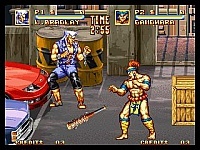 For instance, on the second stage you are actually fighting in an alleyway with parked cars on either side. This is actually more than a graphical difference, because obviously there are no ropes to bounce off anymore but you do get weapons on the floor that you can use. These weapons include spiky poles and stun guns, which can be fun, although they don't really help all that much because they are slow. There is another different street level that you can fight on and also there is a death match stage where the ropes are electrocuted (similar to death matches in World Heroes). This isn't amazing, but it is a nice touch. Something that is strange is that in the wrestling rings, you can't move all the way down to the bottom of the screen, which looks a bit stupid. It would have been nice if you could have more fights outside the ring too, because these are always the most fun in wrestling games (especially if there are weapons lying around such as tables, chairs, steel steps and buckets!). This is a shame because this could have added a lot to the game. I have to say that graphically this game is quite well done. The wrestlers are big and look good and the backgrounds are good too. There are some cool little touches such as the cameraman filming the action and also the interaction you have with some of the objects in the background. When you are outside the ring you can break the tables by throwing someone on them and when you are outside you can smash up the parked cars which is cool. The quality of the sound is not too bad at all, especially for one of the older Neo titles. Musically it is fairly decent and there are some fairly good tunes to accompany the action. The sound effects are O.K. and there is plenty of speech, especially at the start of each match when the announcer calls out the wrestlers names. 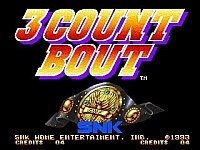 Although there are a lot of good things to say about 3 Count Bout, those are outweighed by the bad things unfortunately. This is not an awful game by any means; it just has some horrible flaws. The main problem with it is the difficulty setting. Even if it is set to the lowest difficulty, it is still very, very hard to beat. Most of the matches are won by pure luck instead of skill, which is a bad thing. Despite the flaws it's still enjoyable, provided you can get used to it. However, if you want a really good 2D wrestling game, then I really suggest you go and check out the aforementioned Wrestle Fest game if you have some way to play it (emulation? ;)). A sequel would be nice but it's extremely unlikely to happen. You gave this pile of tosh a 5/10 for replay and Burning fight only got a 3?